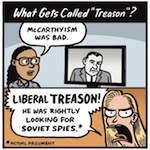 Jen Sorensen is noticing a disturbing trend: it seems some factions can see treason everywhere — except in instances where it’s actually occurring. The President now seeks to pardon himself and others, but the lawyers got to get by this being an admission of guilt, or obstruction of justice. The Red-Line being the special prosecutor following the personal money trail of President and others which has nothing to do with Russia; despite the millions that were loaned, made and owed. As the Head of Ethics Office Resigns, because there’s no shame in the administrations game. 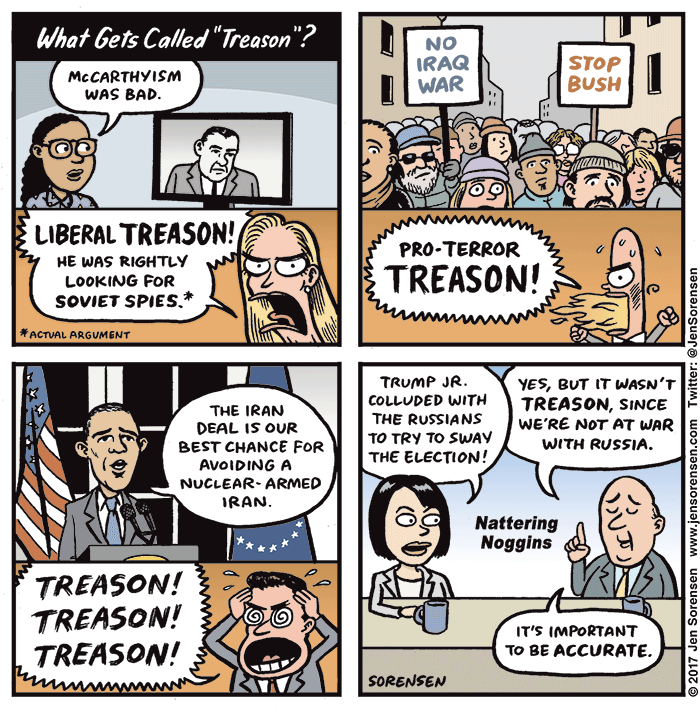 Treason was actually the widespread Voter Fraud that took place during the 2016 election, because of the obvious larger crowd size during the inauguration. Also, Sean needs to bring that mini fridge back.